With the shock retreat from public office of the Reserve Bank of India chief comes the rise to international prominence of long-time nemesis Subramanian Swamy, a nationalist named to the Upper House of parliament in April by the Bharatiya Janata Party. 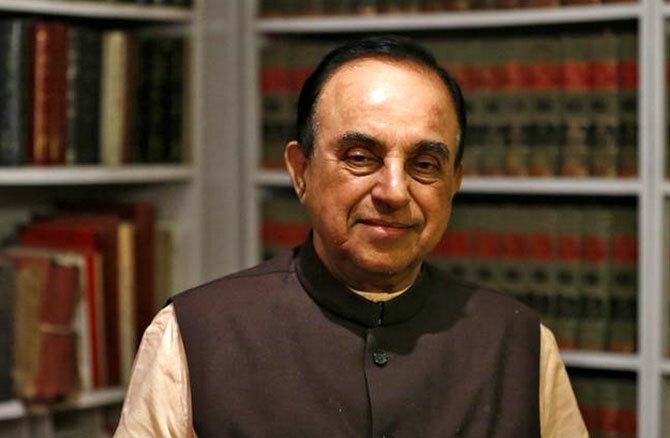 Swamy, a Harvard-educated economist, has a track record of criticising Raghuram Rajan, whose decision on Saturday to step down as Reserve Bank of India (RBI) governor when his term ends in September rattled government officials and foreign investors. Even before Prime Minister Narendra Modi swept to power in 2014, Swamy was agitating for Rajan's removal. "We can make it worthwhile for him to leave," he told Reuters at the time. The campaign gathered intensity since Swamy's promotion to the Rajya Sabha, and his language has mirrored that of the Rashtriya Swayamsevak Sangh (RSS), the right-wing Hindu ideological parent of the ruling Bharatiya Janata Party. Modi had thrown his support behind Rajan, describing him as the "best teacher" for explaining economic issues and telling a meeting of finance ministry officials not to publicly question the RBI. That Rajan is now headed for the exit underlines both Swamy's mettle as a political antagonist and the balance Modi must strike between modernising India's economy and appeasing his nationalist vote bank that leans towards protectionism. Swamy, renowned for sometimes fiery campaigns against those who raise his ire, declined to speak to Reuters when approached at his home, or to answer text messages, since Rajan made his announcement. He did speak to ANI, a partner of Reuters Television, saying that "if he (Rajan) says that he wants to go and he wants to save his self-respect I have no problem. Let him pretend that he is giving up and going. But as long as he goes, it is good." The RSS, an organisation that works mostly behind the scenes but which preaches self-sufficiency and is suspicious of foreign influence, has made no secret of its desire to unseat Rajan, a former chief economist at the International Monetary Fund now on leave from his professorship at the University of Chicago. During a meeting with aides and the RSS earlier this year, Modi said that Swamy, who is on the Bharatiya Janata Party's (BJP) national executive committee, should be kept out of government, according to two people who attended. The RSS suggested that Swamy be given a spot in the Rajya Sabha, said a senior RSS leader who attended the meeting, and Modi relented. Less than a month after gaining his berth in parliament, Swamy wrote an open letter to Modi that questioned Rajan's loyalty to India as a holder of an American green card. He accused the governor of an "apparently deliberate attempt" to "wreck the Indian economy." It was "in the national interest" to fire Rajan, Swamy wrote. Swamy's own contradictions are not uncommon in Indian politics. He holds a doctorate in economics from Harvard and has lambasted others for their Western backgrounds, and gives frequent media interviews yet voices disdain for the press. He does not shy from self-promotion, having long proclaimed his suitability to serve as India's finance minister. Swamy also appears to relish a fight, including taking on the Gandhi political dynasty and pushing for the construction of a Hindu temple at a disputed site. On his Twitter profile he notes: "I give as good as I get." His letter to Modi repeated a longstanding RSS complaint that by keeping interest rates relatively high, Rajan squeezed small- and medium-sized firms, mainstays of the organisation. Also, in the RSS' view, by launching an aggressive campaign to clean up banks' non-performing assets, Rajan further discouraged new loans to Indian businessmen, said an India-based banker who recently attended a program hosted by the group. "Rajan made the right decision to leave, because he was not in synch with the Indian economy," S Gurumurthy, a senior member of the RSS' economic wing, told Reuters. "India does not need a celebrity or a popular economist, we need someone who can keep his head down and work. We need an economist who has witnessed rural distress." Rajan has not given a full explanation for his decision to step down, but on Monday defended his actions at the RBI. While he has plenty of critics at home, Rajan is a favourite among foreign investors and has been credited for bringing inflation under control. A person who worked closely with Rajan pointed to Swamy's words and the government's failure to push back publicly as a tipping point for the governor. "He had cordial enough relations with the top leadership in the government," said the person, who asked not to be named because of the sensitivity of the issue. "But these attacks by Swamy were too personal, and no self-respecting person can take that." On Monday, with news of Rajan's departure still resonating, Modi took to social media to announce a series of reforms allowing more foreign direct investment in aviation, defence and retail. The changes came with a message from Modi: he was making "India the most open economy in the world."